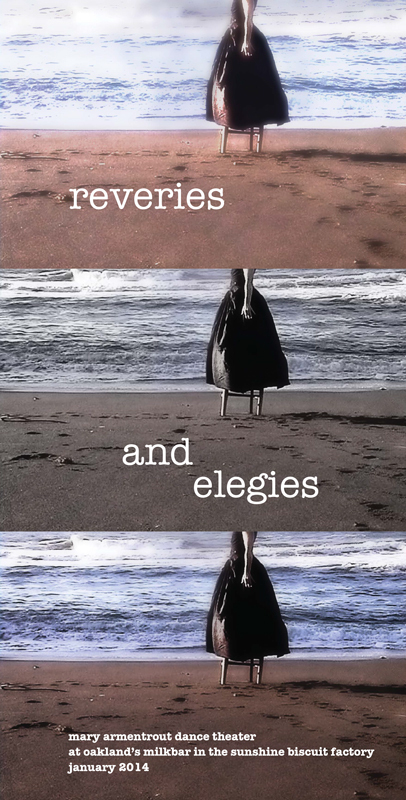 Coming up weekends in Jan 2014 (4,5,11,12,18,19,25,26) is the return of mary armentrout dance theater’s reveries and elegies to the MilkBar, before it departs for Roehampton University, London for a residency and performance Wed. Feb. 12th, 2014. The London performance is part of Roehampton University’s Dance Diary series. The show is Wed. Feb. 12th at 7pm. See Roehampton Dance Dept for details and tickets. And on the Fridays before (1/10, 1/17) you can come to special gallery evenings from 4 to 7 pm showing the entire series of site-specific videos and time-lapse installation I’ve created for the project. reveries and elegies at the milkbar, jan 2014.
reveries and elegies is Mary Armentrout’s current site specific performance project – a shifting, wandering, accumulating, de-accumulating installation that is trying to deal with a shifting, ungraspable subject: change, loss, dislocation.